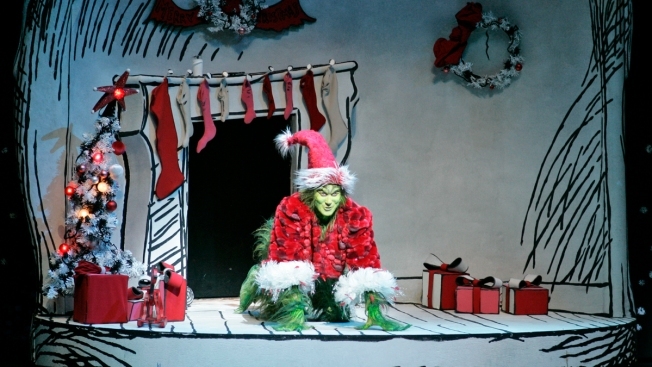 FILE - Patrick Page performs as the Grinch during the final dress rehearsal of Dr. Seuss' "How the Grinch Stole Christmas" Wednesday, Oct. 25, 2006, in New York. The fate of dozens of cast members from a popular Christmas show headed to Boston is in limbo following a snowstorm in Chicago. The cast of "Dr. Seuss’ How The Grinch Stole Christmas! The Musical" just finished their run at the Chicago Theatre Sunday and ended up getting stuck at O'Hare due to the blizzard-like conditions that dumped several inches of snow by Monday. About 60 cast members are still due to arrive in Boston to begin their run at the Boch Center. A spokesperson for the Boston show said Monday she had not heard the cast had been stranded but would have them drive, if necessary, to make sure they made it in time for the start of the Wednesday show.